Metal maniacs, rejoice! I am proud to present to you: REVENGE; signed via Season Of Mist, hailing from Canadian grounds - performing Black/Death Metal, on their 4th EP entitled: “Deceiver.Diseased.Miasmic”. (released December 7th, 2018). Since formation in 2000; the band in question have 4 EPs, 5 albums, and 3 Splits in their discovery so far. 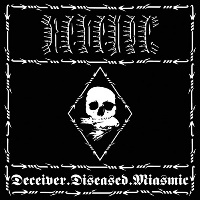 I am introduced to their 4th EP entitled: “Deceiver.Diseased.Miasmic”. 2 tracks ranging at around 08:37; REVENGE arrange an intricately designed formula of heavy-hitting Black/Death Metal amalgamations, “Disceased Intrusion” begins the EP (or single in this case as it is only 2 songs) – conveying boistrously bouncy chugs and gallops in which create dominately chaotic mayhem. This is not for the faint of heart; as Nuke Chanter (vocalist) J. Read develops aggressively extreme noise terror, profusely relentless robustness of persistently vehement pipes of savagely sinister solidity. At first I needed time for them to grow on me, it did not take too long though… as this is deadly hostility at its most rambunctious. Consisting of crunchy drum elements and amplified adrenaline; implementing diversely dynamic rhythms, riffs and solos that will make anyone break chairs over other chairs. “Deceiver Futile” overall concludes the EP; demonstrating complexly dextrous efficiency, constructively destroyed and distinguished with adroit annihilation – attributing an aesthetic of composed consistency and concrete grit. V distributes a grandiose manifestation of meticulous melodies that thunderously stampedes with hammering; haste, harmonious heaviness & blistering batters of rampaging skill – detailed with stabilty and progressively primitive technicalities. Thrashing with thumpy; audible bass injections, also gives off an infectiously inventive dose of hardened and blackened metal devastation. Overall; I found “Deceiver.Deceased.Miasmic” a grand EP, REVENGE certainly outdone themselves – ultilizing versatility and a borderline foundation of flamboyantly crushing finesse, this here discovery is worth the time.